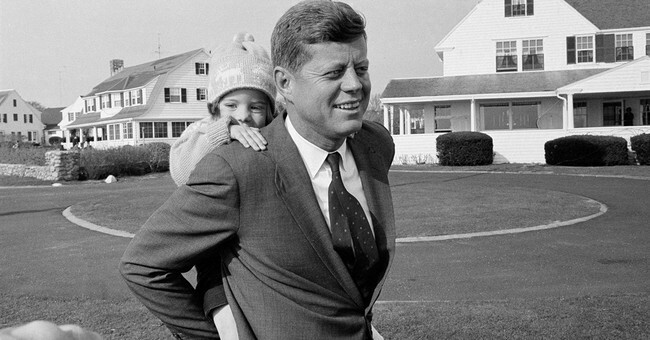 John F. Kennedy became more myth than man with his assassination, a half-century ago this month. Jackie Kennedy herself said so. A year after Dallas, in a memorial issue of the old Look magazine, she wrote that she had wanted to grow old with the man, to see their children grown up, but she was destined to grow old only with the myth. Only the legend survived. The shaping of the legend is what the commemoration of the 50th anniversary of the assassination this month is all about. The National Geographic Channel, whose documentaries are usually concerned with penguins, polar bears and other natural wonders of nature, propels the latest cycle of contemporary reflections on the man and the myth with "Killing Kennedy," a docudrama based on the book by Bill O'Reilly and Martin Dugard. Ginnifer Goodwin, the actress portraying Jackie, says she imagined she was channeling the first lady's ghost; Rob Lowe, who played the president, tells how he cried when he looked at the limousine where JFK took the fatal bullet, proud to pay tribute to a legacy that "belongs to all of us." That legacy, however, is now hotly disputed among historians, politicians, pundits and professors educating the generations to come. Textbooks published shortly after the assassination on Nov. 22, 1963, were about the man whose rhetoric cheered and inspired, beginning with his inaugural address and the memorable peroration: "Ask not what your country can do for you, ask what you can do for your country." That oft-repeated phrase was replaced in later textbooks by a recitation of Kennedy's failures as president and what the government ought to do for us. This change, Gilbert Sewall, the director of the American Textbook Council, told The New York Times, accompanied "revisionist" attitudes toward America. It's these attitudes -- emphasizing the nation's flaws and not its heroes, the mistreatment of minorities and not the civil rights revolution that followed, the fact that several of the Founding Fathers owned slaves and not the fact that it was those Founding Fathers who bequeathed the means and the inspiration to correct the sins of history -- that have soured the many on their country. For them, Jack Kennedy's "fiasco" in the Bay of Pigs rests on a long continuum of what's exceptionally wrong with America. Kennedy's triumph over Nikita Khrushchev in the Cuban missile crisis is interpreted as a "rash" tactic that led the world to the brink of nuclear war, rather than a successful strategy of "toughness and restraint" that would eventually free the world from the terrors of the Cold War. Ironically, it was Jackie who set in motion these attitudes when she set out to erase from his biography the fact that he was killed by "some silly little communist," and substituted the notion that he was martyred for his support for the civil rights of blacks. Staging his funeral in imitation of Abraham Lincoln's, she wanted to shift the focus from the perils of the Cold War and Soviet power to the heroics of the civil rights movement. In this scenario, Dallas became the expression of a violent Southern culture of guns and bigotry. Tass, the central news agency for the Soviet Union, took the cue, claiming that Kennedy's assassin was set up by Ku Klux Klansmen. Once the assassin, Lee Harvey Oswald, was slain, he never had the chance to say for himself why he had defected to the Soviet Union in 1959, renounced American citizenship, marched in support of Fidel Castro and, seven months before he shot JFK, had tried to kill Edwin Walker, a retired major general of the U.S. Army and a fierce anti-communist. Oliver Stone, a committed moviemaker of the left, further fed the fires of conspiracy. James Pierson, author of the 2007 book "Camelot and the Cultural Revolution," argues that the Kennedy assassination shattered traditional liberalism, turning it away from the accepted narrative of optimism and pride in what America could accomplish as protector of the free world, to a splintered perception of how violent America had become. The social consensus that once united America against the threat of communism turned adversarial. No one over 30 could be trusted. The left's heroes would be Castro, Ho Chi Minh and Mao Zedong. Ronald Reagan gave us a brief burst of sunshine on his "Morning in America." But anti-Americanism, like a rolling stone, regained momentum as each new generation of rebels searched for a cause, and the culture was riven by an elite media cultivating polarities. Divided identities begat divided values, confusion begat divided politics. Social consensus, at home and abroad, died with the rise of collective guilt. Not even Sept. 11 could undo it.